The tar spot fungus has flourished following wet, cool weather earlier this year. It’s been a rough few years for the region’s trees: A dry 2015 was followed by drought conditions in 2016, then a surge of hungry gypsy moth caterpillars chowed down on leaves earlier this year. 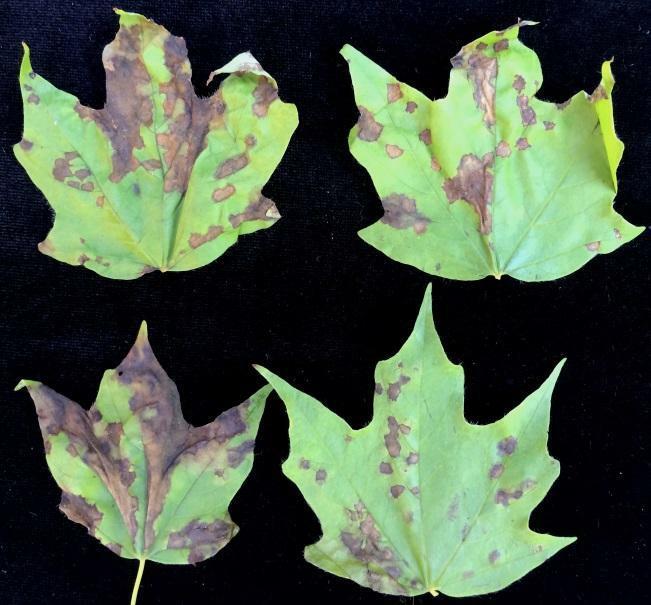 And this year’s wet, cooler weather brought another problem: leaf-damaging fungi are hitting some maple trees hard this summer. Some forestry experts are blaming the damage on tar spot, a condition named for the dark patches that develop on the leaves of a variety of maples before the leaves drop off. The condition affects Norway maples, which are plentiful in the Northeast after they were planted decades ago to replace American elms felled by Dutch elm disease. While tar spot fungus is no Dutch elm disease, and otherwise healthy trees are not at risk for long-term damage, it can mean that parts of the late summer’s leafy green landscape could look thinner than usual. “It can be very showy and makes people worry their trees are dying,” said Ken Gooch, forest health program director at the state Department of Conservation and Recreation. Phil Perron, with Barrett Tree Service East in Medford, said arborists refrain from using fungicide to prevent the tar spot fungus since the damaged leaves don’t pose a life-threatening risk to trees. “It’s an aesthetic thing; [tar spot] does no harm to the tree. Most people just live with it,” Perron said. 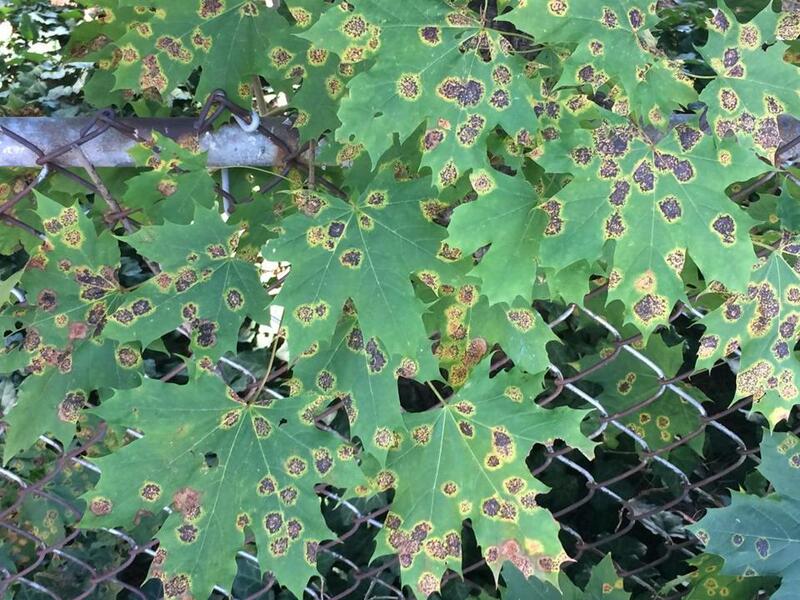 Normally, most people don’t see the effects of tar spot, thinking the dropping leaves of infected trees are part of the fall season, said Marc Welch, director of Newton’s urban forestry program. But some of the city’s maples have shown signs of the fungus earlier this year due to the wet weather, he said. “We’ve definitely noticed an uptick of questions about it,” Welch said. While some officials think the tar spot is causing some maples’ patchy leaves to brown and drop off, not all are sure. Nicholas J. Brazee, a pathologist at the University of Massachusetts Amherst’s Extension Landscape, Nursery & Urban Forestry Program, said that an examination of leaf samples since May suggests the early leaf drop may be a sign of another condition, called anthracnose. This is what anthracnose looks like, according to a UMass expert. Anthracnose, caused by a number of different kinds of fungi, describes leaf conditions that include browning and drop off, he said. And like tar spot, the fungi that can cause anthracnose thrive in wet conditions, he said. Anthracnose can affect several kinds of maples, including Norway, Japanese, sugar, red, and silver, he said. Tar spot is caused by fungus in the genus rhytisma, Brazee said, and different species of that genus can cause the dark discoloration on affected leaves. Norway maples appear hardest hit by tar spot because Norways can develop larger dark patches than other types of maple trees, he said. The wet weather was conducive to the growth of the fungal spores that cause tar spots and anthracnose. Spores causing the conditions spread when leaves that have the spores fall to the ground, and blowing wind the following spring spreads spores onto new leaves, he said. Symptoms for anthracnose develop in the springtime, and then the fungi can go dormant during the summer months, only to reemerge to cause more damage in the autumn, Brazee said. Tar spot usually develops over the course of the summer, starting off as yellow spots that grow and darken, Brazee said. It is difficult to prevent trees from being affected by the fungal spores if they are already out in the environment, he said. But whether it is tar spot or anthracnose, the region’s maples should survive. “It’s not good for them to lose [an] amount of foliage right now, but if the tree is otherwise heathy, it probably will not die,” Brazee said.